All of the exporters are available from the File->Export... Menu from the Pull-Down Menu in Vanilla. You can set up the length of the outputted Name and Description Fields to what you want. 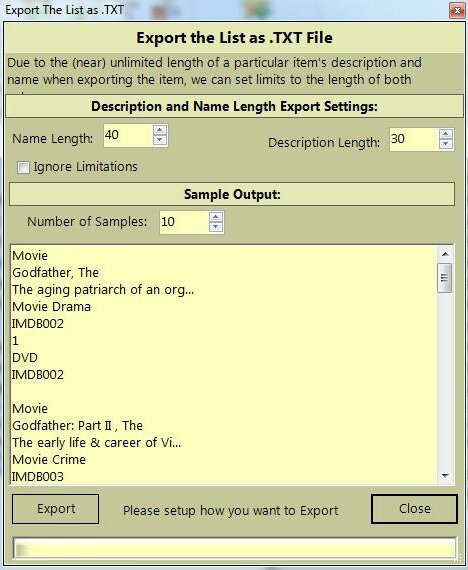 Simply change the relevant values under the "Description and Name Length Export Settings". This works exactly the same way as it does in the Options Window. There is a checkbox underneath the values called "Ignore Limitations". This will not trim any of the Name or Description fields, but instead dump the entire length of the Name and Descriptions Fields to the Text file no matter how large they are. 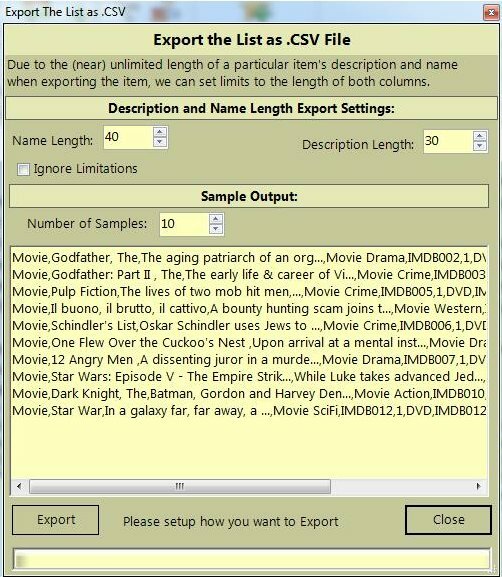 Below the Limitations section, there is a section called "Sample Output". This will show you X amount (by default 10 items from your list) of your records as how they would appear in the Text file. Changing any of the Limitation fields will show you in real-time, what the output will look like. You can increase the Sample Output number of records by increasing the "Number of Samples:" value. Once you are satisfied with the way the output from the list will be, then press the Export Button. A file requestor will appear and prompt you for a filename, so enter one, and then Vanilla will export your list to the text File. Here is a Sample of what the Sample List will look like when you export it as a Text File (using the default settings). Click the Blue headers to see the relevant export. You can set up the length of the outputted Name and Description Fields to what you want. Simply chance the relevant values under the "Description and Name Length Export Settings". This works exactly the same way as it does in the Options Window. There is a checkbox underneath the values called "Ignore Limitations". This will not trim any of the Name or Description fields, but instead dump the entire length of the Name and Descriptions Fields to the file. Below the Limitations section, there is a section called "Sample Output". This will show you X amount (by default 10 items from your list) of your records as how they will appear in the CSV file. Changing any of the Limitation fields will show you in real-time, what the output will look like. You can increase the Sample Output number of record by increasing the "Number of Samples:" value. Once you are satisfied with the way the output from the list will be, then press the Export Button. A file requestor will appear and prompt you for a filename, so enter one, and then Vanilla will export your list to the CSV File. As you can see, it is easy to export your list into other formats.